The instructions stated: “On advice of the association’s attorney and in accordance with Arizona’s Nonprofit Corporations Act 10-3708, Action by Written Ballot, there is a provision to vote “For” or “Against” each candidate.” Is this the proper way to construct a ballot for the election of officers? ‘Notwithstanding’ means that ARS 33-1812 overrides the provisions contained in ARS 10-3708 and the community documents. A ‘proposed action’ is universally interpreted to mean voting on issues, not candidates. The statement on the ballot there is a provision in 10-3708 to vote ‘For or “Against” each candidate is totally false. The ballot instructions are contradictory. 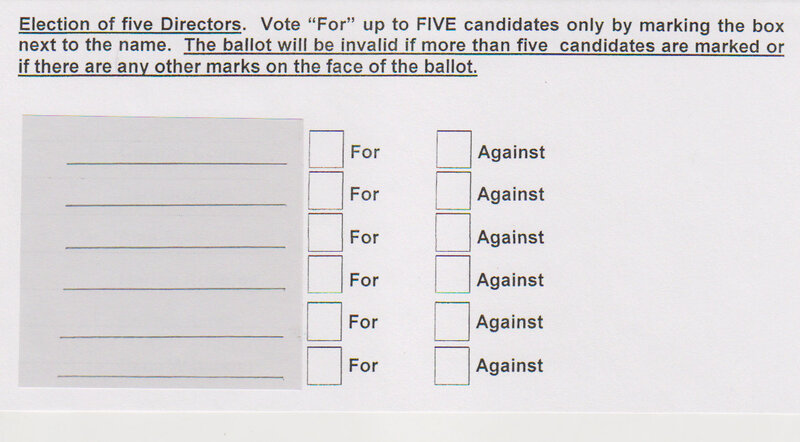 If anyone votes ‘Against’ a candidate, this would be another mark on the face of the ballot which would invalidate it. The Board President should be the only person to talk with the attorney and make a statement to the residents – NOT THE MANAGER. In Arizona, the Manager is an unlicensed contractor or vendor with no governing authority. These actions by the Manager could invalidate the election results and an action could be brought against the Board for breach of fiduciary duty. B. Votes cast by absentee ballot or other form of delivery, including the use of e-mail and fax delivery, are valid for the purpose of establishing a quorum. C. Notwithstanding subsection A of this section, an association for a timeshare plan as defined in section 32-2197 may permit votes by a proxy that is duly executed by a unit owner. D. For the purposes of this section, “period of declarant control” means the time during which the declarant or persons designated by the declarant may elect or appoint the members of the board of directors pursuant to the community documents or by virtue of superior voting power. Our HOA management company, Platinum Management (https://www.platinumonline.org/) provided a similar ballot for our annual membership meeting. I have had numerous conversations with management president Kathleen Buske pointing out that “each proposed action” does not apply to candidate selection. She seems to understand “The ballot shall provide an opportunity to vote for or against” but has no clue as to the meaning of the crucial phrase, “each proposed action”. I have pointed out to her that a proposed action is a single item on a ballot that can be presented as a question that can be answered either “yes” or “no”. In Arizona, each proposed action must address only one subject. Such laws are also known as single-subject rules. See law: Arizona Constitution, Article 21, Section 1 and Arizona Constitution, Article 4, Part 2, Section 13. Arizona Revised Statutes 16-502 clearly separates voting on a candidate (a selection process) from voting on a proposed action (a yes or no vote). 1) our position is supported by legal counsel (I suggested that she fire her legal counselor). Here is an example of an HOA management company that cannot comprehend statutes and refuses to listen to logical explanations. Sort of makes one wonder about any decree they make. Can I include your comments in 8. Arizona HOAs/Hall of Shame? Admin.